DataKeeper Driver (ExtMirr.sys) – The DataKeeper Driver is a kernel mode driver and is responsible for all mirroring activity between the mirror endpoints. DataKeeper Service (ExtMirrSvc.exe) – The DataKeeper Service links the DataKeeper GUI and Command Line Interface to the DataKeeper Driver. All commands to manipulate the mirror are relayed through the DataKeeper Service to the DataKeeper Driver. *Important: Stopping the DataKeeper Service does not stop mirroring. Sending the driver a PAUSE mirror, BREAK mirror or DELETE mirror command is the only way to interrupt mirroring. DataKeeper Service Log On ID and Password Selection – The DataKeeper Service Log On ID and Password Selection allows you to select the type of account to be used to start the service. Domain and Server account IDs with administrator privileges allow improved disaster recovery when network disruptions occur. Command Line Interface (EMCMD.exe) – There is an entire suite of EMCMD command options that can be used to operate DataKeeper. DataKeeper GUI (Datakeeper.msc) – The DataKeeper GUI is an MMC 3.0 (Microsoft Management Console) based user interface which allows you to control mirroring activity and obtain mirror status. Packaging files, SIOS Protection Suite scripts, help files, etc. 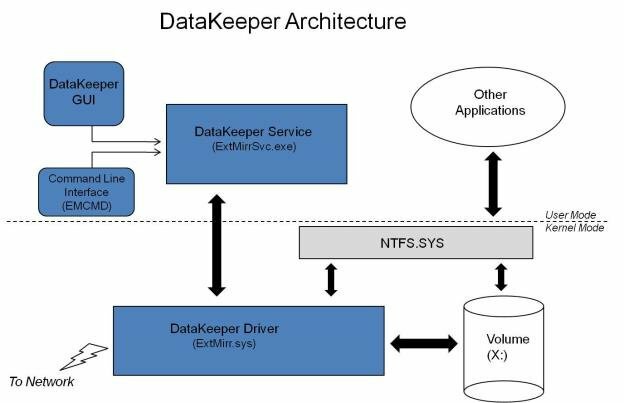 The following diagram displays how the DataKeeper components interface with the NTFS file system and each other to perform data replication.